Aussie singles are making the most of the senior online dating industry: these platforms have become a great option to make new friends, and meet a possible partner. In that sense, if you are looking for a perfect dating site for you, we unveil the secrets of one of the most trusted Australian dating sites to help you make the right choice: EliteSingles. 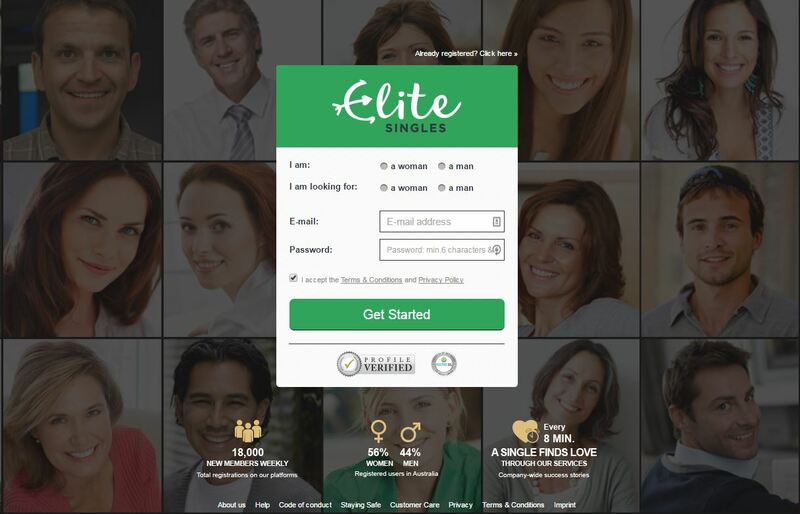 The platform was launched in 2008 and during all this time, more than 2,000 couples worldwide have been created thanks to EliteSingles unique matching process. The dating sites analyses singles’ psychology and personality with the idea to recommend them more suitable partners. EliteSingles‘ registration is one of its main characteristics as it requires you to fill a very dynamic questionnaire with where your personality is measured. The test focuses, among other aspects, on your to social and romantic preferences, your idea of the perfect partner, your cultural, economic and social status as well as your amorous expectations. Once the questionnaire and the profile are completed (with the pictured uploaded !) you will be able to access the dating website: a platform for ambitious and serious singles that seek to receive cupid with their arms wide open. There are two ways you can find a potential partner. On one way, EliteSingles sends you partner suggestions after considering your compatibility test results. On the other, you can use the advanced search to connect with like-minded singles living in the same area! The best way to break the ice with a particular user is by showing your interest by sending a “like”, and if corresponded, you can adventure yourselves to engage on a private conversation and select a day for your first of many dates! EliteSingles biggest promise is that you will be connected with sophisticated singles that, like you, think big when it comes to business, but also to their love life. The platform accomplishes this task very well, as to be part of the community you must complete the compatibility test and participate. This is why the users you will find on this platform are very serious about their intentions to find their significant other! You may like to have a look at the EliteSingles online mag to get some tips and go back on the dating scene. There are two ways to participate in EliteSingles: you can use a basic account and Premium one. With a standard account, you will be able to create your profile, upload some photos, take the compatibility test and check your results, receive daily partner recommendations, and show your interest in particular users by sending a “like”. Security and privacy are very strong on this dating site as it has implemented security measures to encrypt information and ensure its users’ privacy. The platform promises to keep your personal data in good hands as they do not share with third parties. Elitesingles’s customer service is very present and stronger in Australia. So, they are highly proactive and have the ability to quickly respond to possible problems related to the website’s functioning. EliteSingles has grown over the years in Australia and nowadays is the leading dating sites for ambitious singles. Its unique matching process ensures the seriousness and honesty of its users. It has become a great community of successful and educated singles who seek to succeed in their love life too! If your expectations include to expand your social circle, meet like-minded singles from your area or find a suitable date who in time can turn into your other half, then EliteSingles can have all your romantic need well covered.